A high court sitting in Jos, Plateau State had on Friday, April 8, nullified the September 2014 election that put Amaju Pinnick in office as the NFF President following a petition by his opponent, Chris Giwa. But the world football governing body, FIFA has reacted to the Jos High Court ruling, saying it can't hold water on Nigeria Football Federation, NFF and any action to unseat Amaju Pinnick's led board would attract a possible ban. 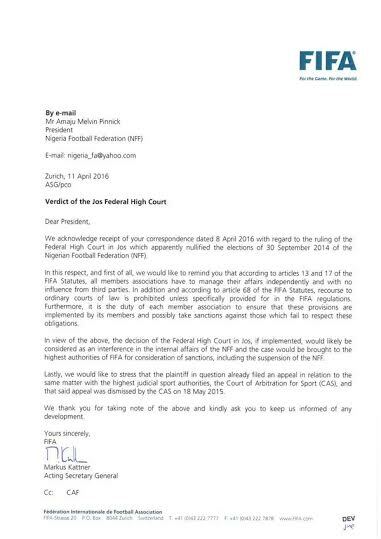 According to a letter by FIFA dated April 11, 2016, if the decision of the federal high court in Jos last week is carried out, it would be considered as an interference in the internal affairs of the NFF. 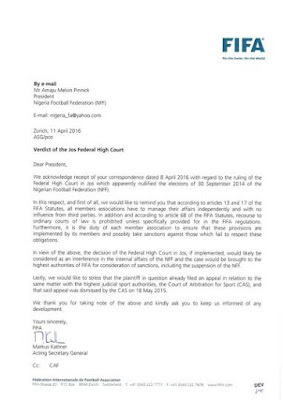 FIFA wrote in a letter addressed to Amaju Pinnick, the embattled NFF boss on Mondaythat Article 13 and 17 of FIFA are clear that there should not be interference whatsoever with the running of football in the country. "All members associations have to manage their affairs independently and with no influence from a third party. The decision of the Federal High Court in Jos if implemented would amount to interference and the case would be brought to the highest authority of the FIFA for consideration for sanctions, including the suspension of NFF," FIFA's acting Secretary General, Markus Kathner wrote. FIFA emphasised that Chris Giwa has taken his case as far the Arbitration of Sports, CAS, which he lost.